Maltodextrin is produced from starch by partial hydrolysis method, and is usually used as a food additive to preserve food flavor, enhance its taste, quality and appearance. It has texturizing, gelling, emulsifying and non-crystallizing properties. Maltodextrin is largely used in canned fruits, shakes, sauces, puddings and beer. It is also used to thicken the food products and as a sugar substitute, at a very minimal expense. Major sources of maltodextrin are starch derived from corn, potato and rice. The demand and supply of maltodextrin is largely dependent upon the type of crop being used for extraction i.e. a GMO (genetically modified organism) crop or organic crop. Countries such as France, Germany, Greece, Switzerland, Turkey, Algeria, Peru, Saudi Arabia and Azerbaijan are prohibited to cultivate GMO crops. As per the U.S. Food and Drug Administration (FDA) maltodextrin is considered as a safe food additive. According to the Dietary Guidelines for Americans, carbohydrates are required not more than 45–65 percent of overall calories, thus inclusion of maltodextrin in diet can supplement carbohydrates in the people diagnosed with low carbohydrates and low sugar levels. Maltodextrin application is largely grabbing its stake in cosmetic industry, as it is proved to be an effective anti-ageing and anti-irritant. Goldstein Research analyst forecast that the global maltodextrin market size is set to reach USD 4.21 billion by 2025, growing at a CAGR of 4.80% over the forecast period. Advancement in extraction of maltodextrin, rise in production of organic crop sources, demand from various industries using maltodextrin, favorable government regulation over use of maltodextrin are some of the factors impacting the growth of global Maltodextrin market. The report covers the present ground scenario and the future growth prospects of the maltodextrin market for 2017-2025 along with the global sales and global revenue of maltodextrin. We calculated the market size and revenue share on the basis of revenue generated from major players across the globe. We have forecast the market on the basis of production of crops used for maltodextrin extraction, export and import of maltodextrin, research and development on maltodextrin. On the basis of application, food and beverage industry is the major contributor in the growth of global maltodextrin market share, which accounted for 59.3% in 2017. Food and beverages industry is expected to be the largest consumer of maltodextrin over the forecast period for its application in large variety of food and beverage products, where the food and beverage industry is growing at a CAGR of 12.2%. Application of maltodextrin in pharmaceutical industry is mounting at a rate of 4.1% annually on the back of its application in skin care and also in veterinary pharmaceuticals. Maltodextrin market outlook 2017-2025, has been prepared based on an in-depth market analysis from industry experts. 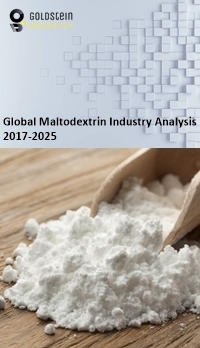 The report covers the competitive landscape and current position of major players in the maltodextrin market. The report also includes porter’s five force model, SWOT analysis, company profiling, business strategies of market players and their business models. Global maltodextrin market report also recognizes value chain analysis to understand the cost differentiation to provide competitive advantage to the existing and new entry players. The trend of using organic products has stimulated the companies to incline towards the use of non-GMO crops in the extraction of maltodextrin from their starch and its application in variety of products. European Union has taken steps to establish sustainability across all industries, thus EU starch manufacturers now use conventional crops (non-GMO varieties) raw materials for extraction of maltodextrin. The “clean label” movement is majorly driving the growth of global maltodextrin market. Consumers have become highly sensitive towards the ingredients used in the food and beverage product. In 2016, 36% of food and beverage product consumers were anxious about ingredients labeled on the product. Clean label includes natural and organic ingredients list, which also helps consumers to identify ingredients that can cause any health issues. Consumption of maltodextrin can cause health issue to the consumers, thus it poses a threat to the food manufacturer using the maltodextrin and also to the maltodextrin suppliers. Maltodextrin can cause problems to people with maltodextrin intolerance or celiac disease or gluten intolerance. It has no nutritional value and causes blood sugar levels to rise and also suppress the growth of probiotics. Based on geography, In 2017, Asia-Pacific accounted for largest market share of 34.2% in global maltodextrin market. Well established food and beverages industry in Asia Pacific countries, backed by growing agricultural sector in China, India, Australia, Philippines and other countries. Ease of availability of raw material for production of maltodextrin is one of the major advantages for the maltodextrin producers. Europe being the GMO crop free region is expected to grow exponentially in future on account of growing demand for maltodextrin obtained from non-GMO crops. Global Maltodextrin market report comprises of the following companies as the key players in the Maltodextrin market: The Archer Daniels Midland Company, Ingredion Incorporated, Grain Processing Corporation, Penford Corporation, Tate & Lyle Plc, Cargill Inc., Roquette Freres SA, Tereos Syral, and Zhucheng Dongxiao Biotechnology Co., Ltd.
What is the revenue of Maltodextrin market in 2016-17 and what would be the expected demand over the forecasted period?